The cronut craze has landed in Las Vegas. Just a couple of weeks ago my search for cronuts in Las Vegas returned nothing. 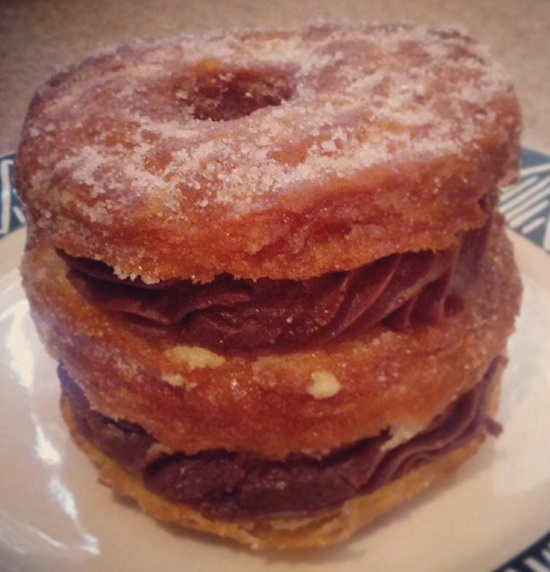 What’s the big deal with a cronut? Here’s a little reason why cronuts are the cool new food. 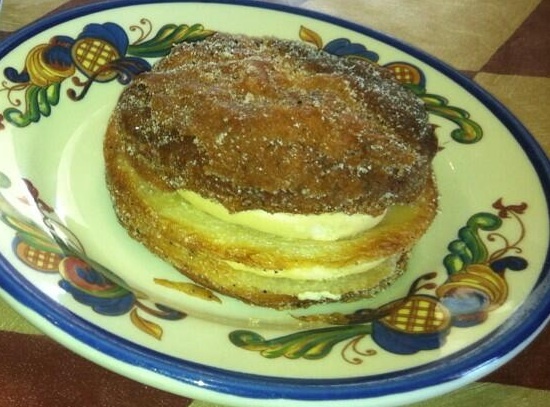 The Cronut is a croissant-doughnut pastry developed by Chef Dominique Ansel for Dominique Ansel Bakery in New York City and offered under the same name. 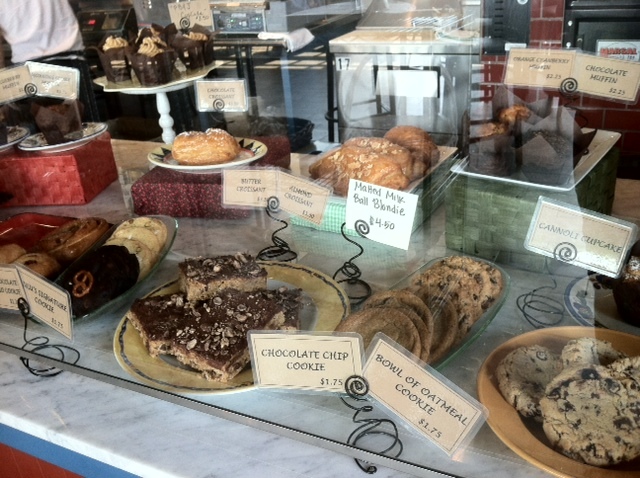 In May 2013, the bakery trademarked the name. The Dominique Ansel Bakery’s website states that though the item is best described as “Half Croissant, Half Doughnut” it is not made by simply frying croissant dough, but a type of laminated dough using a proprietary recipe that took the Chef two months and 10 recipes to create. The bakery’s Facebook site also states that Cronut is not a generic term to describe all croissant-doughnut hybrids, but a specific pastry associated with the bakery. A Boston Globe article describes the Dominique Ansel Bakery croissant-doughnut hybrid as a food portmanteau. I wasn’t excited by the cronut at first but after seeing people so excited by them I became curious. After seeing this photo from Jay Fenster yesterday of a nuttela stuffed cronut from Bread & Butter I really became curious. WHOA! That looks insane. Now I became really curious about trying a cronut but the nuttela cronut from Bread & Butter is about 40 minutes away. Later in the day David Shapiro shared a more “traditional” cronut from Lulu’s Bread and Breakfast which is on my side of Las Vegas. Yes, I was officially intrigued by both of these cronut’s. Even though the nutella stuffed cronut looks better I decided to check out Lulu’s since it’s much closer to my house than Bread and Butter. When I arrived at Lulu’s Bread and Breakfast this morning I was made aware that they only make the cronut on the weekend. Since I was there I decided to get a breakfast sandwich called the Captain America (egg, cheese, ham, sausage). 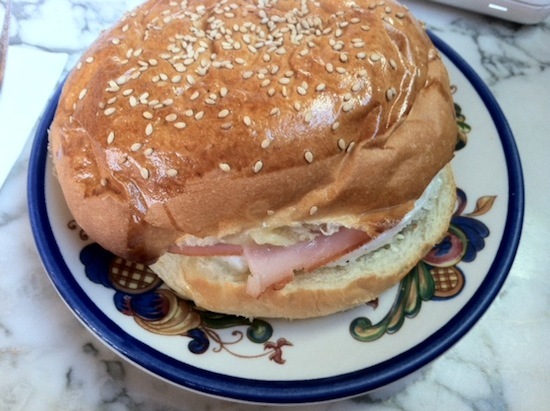 It was one of the best egg sandwiches I’ve had in Las Vegas but it wasn’t a cronut. On my way out I was told that there was also an espresso stuffed cronut on the weekend. I love espresso flavor almost as much as nuttela so I’m pretty sure I’ll return to Lulu’s Bread and Breakfast. When I returned home I was made aware that a third bakery in Las Vegas had cronut’s available. Unfortunately, for me, Bon Chef Cafe is located on the other side of Las Vegas so I probably won’t get there. The cronut has begun its invasion on Las Vegas and my curiosity to try it is greater than ever. As of today here’s where you can find a cronut in Las Vegas. At some point the cronut will reach the casino bakeries in Las Vegas. For the time being cronut’s aren’t available everywhere so I’ll try to keep this list of cronut bakeries in Las Vegas update to date.If you know of any others leave a comment or tweet me. My musical taste has been questioned my whole life. I never really cared about music growing up but hearing Pantera, Goo Goo Dolls and Soundgarden in college for the first time opened my eyes to music that wasn’t on the radio. From that point forward my taste in music has been a little off the wall. I find equal enjoyment from Britney Spears, EPMD, Pantera, Pitbull and Martyr AD. Last night the lineup for the Life is Beautiful festival to take place in downtown Vegas was announced to a lot of fanfare. Headlining this year’s festival, which will take place on October 26th and 27th in Downtown Las Vegas, will be two locally grown acts—The Killers and Imagine Dragons. Also, headlining will be Grammy-winners Kings of Leon and Beck. Childish Gambino, Jurassic 5, Passion Pit, and many others round out the roster. The headlining bands of the Life Is Beautiful lineup is great if you like rock/pop radio. The great news for the music lineup at Life Is Beautiful is that like many festivals it’s complimented by a slew of lesser known bands like Portugal The Man and Youngblood Hawke that could steal the show. Click the image to view full list of bands. Life Is Beautiful will take place all over Downtown Vegas and include food from celebrity chefs and artists from a variety of Vegas shows. Much like Coachella and the other large festivals the bands are just part of the overall experience. Life Is Beautiful provides a great excuse to spend a weekend downtown to enjoy music, food and art. Pro Tip: If you plan on going get a room at El Cortez. Many (if not all) of the events will be happening away from the Fremont Street Experience canopy. Ticket packages will cost between $100 and $350 and go on sale this Friday. Follow @lifeisbeautiful for updates and more information. The Life Is Beautiful website isn’t very “share friendly” so head there for more details. Eating and drinking outside? I’m in! A couple of weeks ago I was invited to have lunch at the new Bagatelle Beach at Tropicana. This was the soft opening and a great way to kick off Cinco De Mayo weekend before losing every bet I made on the Kentucky Derby. Since this was the soft opening I was among the first guests. 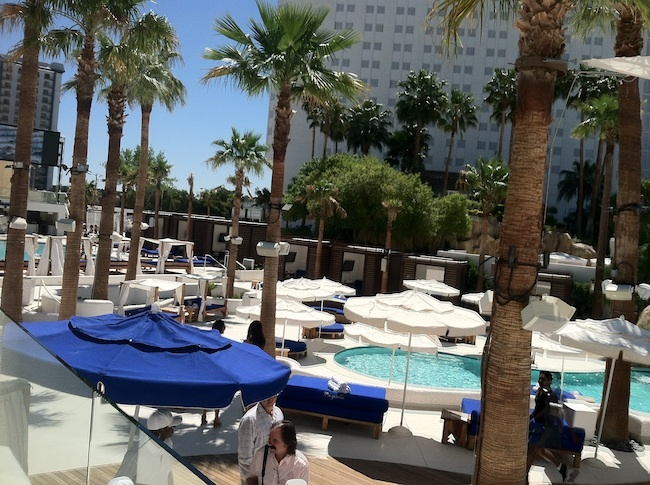 Comparing Bagatelle Beach to Encore Beach Club is only fair in that they’re the same concept but there’s nothing at Tropicana that’s done on the same level as Wynn so it’s really not a fair comparison. Besides I was at Bagatelle Beach for lunch outside and not to scope out bikini babes. Note: Every person serving lunch was a dude, the bikini waitresses seem like they are only for pool customers. Bagatelle Beach is set up with separate areas for people who want to party at the pool and people who just want to grab lunch. 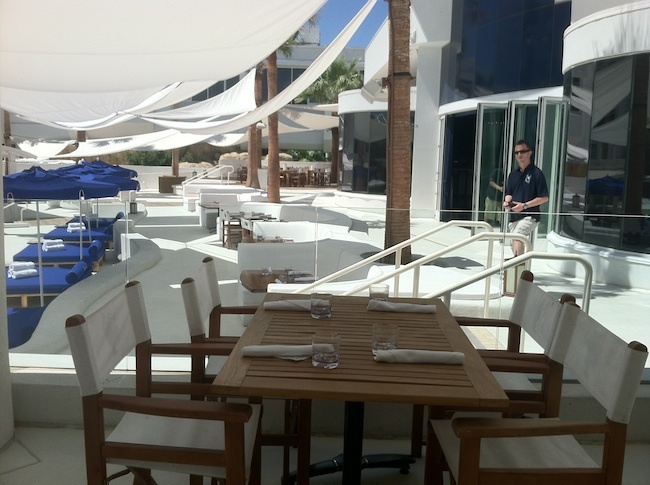 There dining tables set up in a shaded are that are fairly secluded and above the action of the beach club. There are also a few booths closer to the pools with coverings providing shade as you can see below. Lunch began with a cocktail called Le Diablo. I don’t normally drink tequila but I usually enjoy a drink with fresh berries and ginger beer so I figured I’d give it a whirl. Since I was so early the fresh blueberries hadn’t arrived so they used strawberry instead. 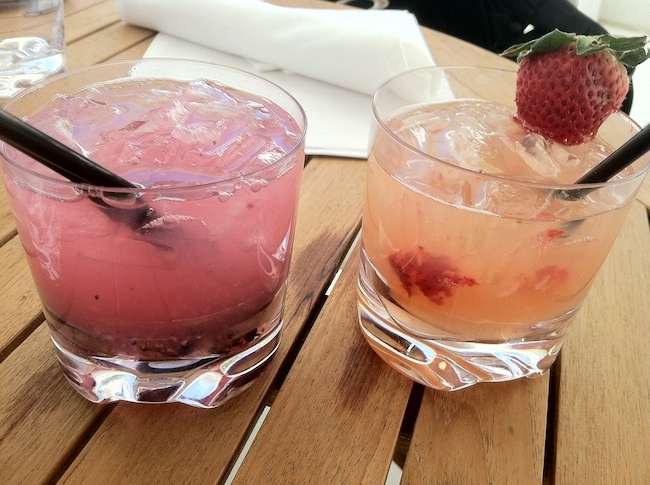 Both drinks were tasty but the original concept of the drink was much better. I always recommend sticking with blueberries when they’re part of the recipe. Additionally, ginger beer is probably my favorite mixer for cocktails. 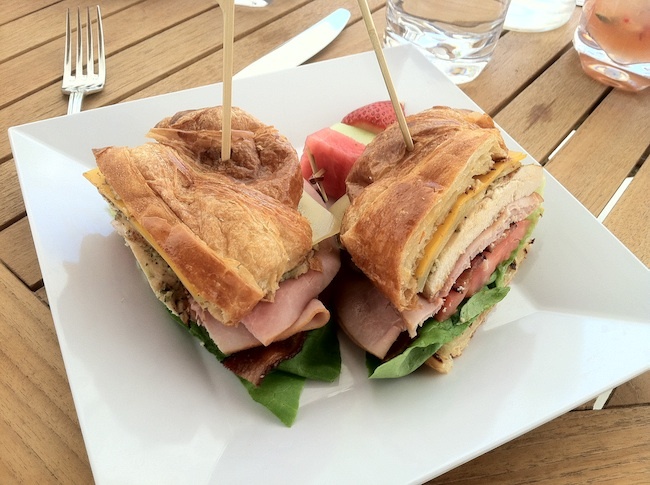 For lunch I had a chicken and turkey club on a croissant. The sandwich was good but nothing particularly special. At $12 (maybe $14) this was priced similarly to most restaurant sandwiches on the strip. Combined with the al fresco dining and drinks this made for a fine base of food for the day. I wouldn’t be upset eating this sandwich again but I wouldn’t go out of my way for it. 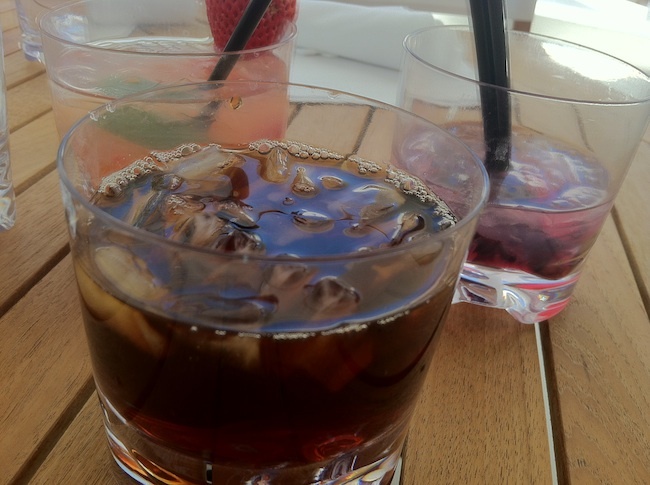 Since I had to drive after lunch I took it easy on the tasty boozy drinks and imbibed a few cups of iced coffee. I don’t look at a day/beach club as the kind of place that many people are ordering iced coffee so I was pleasantly surprised they had it available. While not the highlight of the day it was a nice way to close it. I saw some friends dining out in the booths as I was winding down my lunch so I grabbed this sweet view of the entire Bagatelle Beach complex which comes complete with Hooters in the background. Bagatelle Beach isn’t for everyone. The music is very loud since this is a day club and the DJ mix is today’s EDM (Deadmau5, Calvin Harris) and hip hop (Lil Wayne, Doctor Dre). I enjoyed the music and thought it added to the vibe but it’s not for everyone. I only visit the Tropicana a couple of times a year or so and this may be one of the few times I visit during 2013. The Tropicana isn’t a hotel many people I know visit so there’s rarely an excuse to stop by. Actually, most people I know don’t even stay on the south end of the strip unless they have a conference at Mandalay Bay. I would return to Bagatelle Beach if someone else wanted to go there for lunch but probably wouldn’t go out of my way to return. I’ve already recommend Bagatelle Beach to a couple of people as a place to dine outdoors on that end of the Vegas strip. Lunch was paid for by Bagatelle Beach but my thoughts and pictures are my own. Thanks for all of the Las Vegas steakhouse recommendations here and on twitter. You’ve seen the steakhouses I’ve been to in Vegas and the list below is a combination of your recommendations and my existing list of steak joints to hit up in the near future. There are more recommendations that I’m keeping in the back of my mind that I won’t say no too. I used to try to make it to one steakhouse per month but I’ve been less regular lately. Even if I visit a new place every month this list will take me deep into 2013. If I don’t write a review here I’ll share it on Facebook, Twitter and/ or Tumblr. I love steak and eat it pretty often. 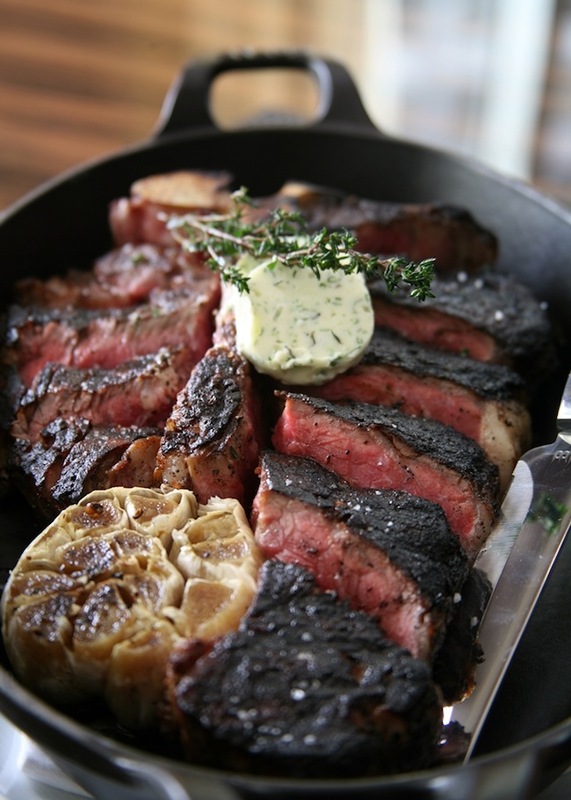 Last week I listed the top 5 steakhouses that I’ve eaten at this year on Vegas Chatter. I did the same last year. Sure I can have an all-time top 5 steakhouse list but there is only so much steak one can eat in a year and chefs and other restaurant staff change often in Las Vegas that I’m not sure that really makes much sense. 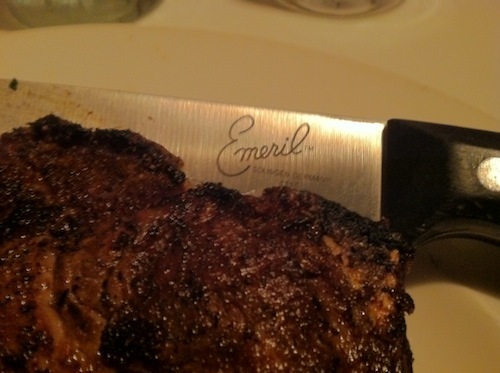 I can’t say that an experience I had two years ago at CarneVino will be the same today. That could be unfair to the restaurant and not accurate to you. Here’s a list of the steakhouses I’ve conquered in my time in Las Vegas. I’ve reviewed most of these on other websites and will share brief thoughts (thumbs up or down) after I’ve completed my hit list of steakhouses. I’ve, obviously, been to some of these more recently than others and some have closed. As you can see I’ve been to a lot of steakhouses in Las Vegas. The list of steakhouses I want to try is running low and I’m looking for new ideas. Leave a comment with any new placed I should try, and why. I’ll share the few steakhouses still on my hit list later this week and will add any that you recommend that I’m interested in (I.e. I’m not interested in STK and you won’t change my mind). I love steak, but don’t eat it as much as I used to (which is probably a good thing). One of my favorite New York (and Atlantic City) steakhouses is coming to Las Vegas soon and I’m stoked. Along with the food Caesars is bringing in the iconic cow that sits atop of the New York OLD HOMESTEAD for the opening at Caesars Palace next week. I never reprint press releases, but I’m stoked and learned something from this press release – The cow has a name – Annabelle! Yes, I’m a wee bit excited about Old Homestead opening in Las Vegas. Learn a little below. 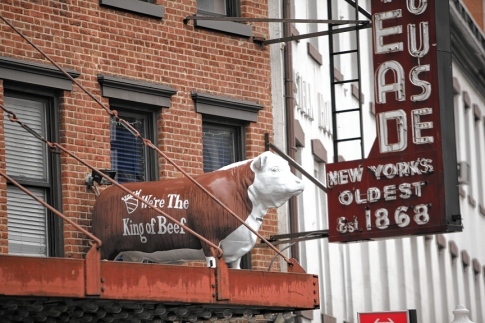 Annabelle, the celebrity cow perched two stories above the entrance of the legendary Old Homestead Steakhouse in Manhattan, is moo-ving to Las Vegas. She begins her cross-country trek today and will arrive in Las Vegas on Dec. 20, in time for the grand opening of Old Homestead Steakhouse at Caesars Palace. Annabelle’s admirers are encouraged to follow her journey to Las Vegas at www.twitter.com/oldhomesteadlvand stay tuned for more details upon her arrival. Fans of Annabelle should not be concerned, as the iconic brown and white cow isn’t being put out to pasture. Dressed in white butcher coats and wearing white gloves, a team of moo-ving men specializing in bovine transport will gently remove Annabelle from the restaurant’s Broadway-like marquee, where she has been perched for the past 60 years as a fixture in the center of New York City’s fashionable Meatpacking District. Before setting her into – or more likely, onto – a super-stretch luxury limousine stocked with plenty of hay, corn feed, moo juice, a slot machine and a blackjack tutorial handbook, the team will groom Annabelle and dress her up in gown, top hat and bow tie. Taking full advantage of the limo, Annabelle plans to ride around Midtown before heading to the airport. The divine bovine intends to visit several major U.S. landmarks and graze through a few malls for some holiday shopping on her way to Las Vegas. One of the emotional highlights of her trip will be an overnight stay at the Nebraska farm where she was born and raised. Annabelle is no stranger to the spotlight, having been featured in several motion pictures and on hit shows such as “Seinfeld” and “The Sopranos.” She has also been photographed by renowned artist and filmmaker Julian Schnabel, whose photos are displayed in the restaurant’s Schnabel Room. Old Homestead Steakhouse is one of New York City’s most historic restaurants, set to open its first location on the west coast at Caesars Palace. With more than 6,000 square-feet, the new restaurant will feature a total of 250 seats with a full dining room, private dining room, lounge and bar. Guests will be introduced to several signature dishes from the classic New York City menu including the popular colossal crab cake, 32-ounce Gotham rib-eye steak and the Old Homestead New York-style cheesecake. Additionally, new menu items will be created exclusive to the Las Vegas location.